Mary, Queen o Scots (7/8 December 1542 – 8 Februar 1587), an aa kent as Mary Stuart or Mary I o Scotland, wis queen regnant o Scotland frae 14 December 1542 tae 24 Julie 1567 an queen consort o Fraunce frae 10 Julie 1559 tae 5 December 1560. Mary, the anerly survivin legitimate bairn o James V o Scotland, wis sax days auld whan her faither dee'd an she accedit tae the throne. She spent maist o her bairnheid in Fraunce while Scotland wis ruled bi regents, an in 1558, she mairied the Dauphin o Fraunce, Francis. He ascendit the French throne as Keeng Francis II in 1559, an Mary briefly becam queen consort o Fraunce, till his daith in December 1560. Widaed, Mary returned tae Scotland, arrivin in Leith on 19 August 1561. Fower years later, she mairied her first cuisin, Henry Stuart, Laird Darnley, but thair union wis unhappy. In Februar 1567, his residence wis destroyed bi an explosion, an Darnley wis foond murthert in the gairden. James Hepburn, 4t Yerl o Boddle, wis generally believed tae hae orchestratit Darnley's daith, but he wis acquittit o the chairge in Apryle 1567, an the follaein month he mairied Mary. Follaein an uprisin against the couple, Mary wis impreesoned in Loch Leven Castle. 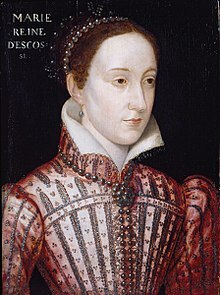 On 24 Julie 1567, she wis forced tae abdicate in favour o James VI, her ane-year-auld son bi Darnley. Efter an unsuccessfu attempt tae regain the throne, she fled soothwarts seekin the pertection o her first cuisin ance remuived, Queen Elizabeth I o Ingland. Mary haed previously claimed Elizabeth's throne as her awn an wis conseedert the legitimate sovereign o Ingland bi mony Inglis Catholics, includin pairteecipants in a rebellion kent as the Risin o the North. Perceivin her as a threit, Elizabeth haed her confined in various castles an manor hooses in the interior o Ingland. Efter aichteen an a hauf years in custody, Mary wis foond guilty o plottin tae assassinate Elizabeth in 1586. She wis beheidit the follaein year. ↑ Bishop John Lesley said Mary wis born on the 7t, but Mary an John Knox claimed the 8t, that wis the feast day o the Immaculate Conception o the Virgin Mary (Fraser 1994, p. 13; Wormald 1988, p. 11). ↑ While Catholic Europe switched tae the New Style Gregorian calendar in the 1580s, Ingland an Scotland retained the Auld Style Julian calendar till 1752. In this airticle, dates afore 1752 are Auld Style, wi the exception that years are assumed tae stairt on 1 Januar rather nor 25 Mairch. This page wis last eeditit on 29 Mey 2018, at 21:27.